Mini Munch is delicious thin-skinned and very heavy cropping - expect up to 20 fruits per week per plant! A great snack at any time of day and perfect for popping into lunch-boxes. 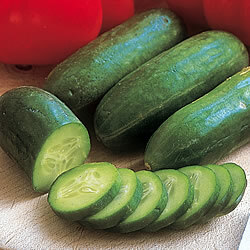 Pick the fruits when 8cm (3in) long or leave them to mature into full-size small cucumbers! Either way As it is an all female variety it is also very easy to manage. Our community of gardeners have a wealth of experience, beautiful garden and great photos, discover more on the following pages: cucumbers, grow your own.